Atheists and Agnostics in Dublin, 1901 | Come Here To Me! Following on from yesterday’s look at the 1911 census, here’s a more comprehensive list at the number of atheists and agnostics in the census taken 10 years previously. In 1901, there were 2 self-confessed Atheists and 20 self-confessed Agnostics in Dublin. The population was 439, 915. Perhaps not surprisingly neither of the 2 Atheists were Irish born. One was from Bradford and the other from the United States. In 1911 this number had risen to 8 Atheists and 24 Agnostics. So that was a 300% increase in the number of Atheists and 20% increase in the number of Agnostics. Atheist bachelor James Honard (30), a servant from Bradford, working at 39 Dominick Street for Thomas McCormack, a Catholic Hotel Proprietor from Westmeath who employed three servants altogether. Atheist James Honard (30) from Bradford. Atheist Charles A Moore (35) , a Commercial Traveler from the U.S.A., boarding at 6 Wellington Quay. Agnostic John Forsyth (46), a ‘Hand Town Bootmaker’ from Navan, Co. Meath, living with Roman Catholic wife and seven children at 4.1 Peters Row, Dublin 8. Agnostic John Arnall (31), a ‘Metalliferous Mining Agent (Photography)’ from Surrey, England, living with his Catholic wife from London and two children at 15.2, Grantham Street, Dublin 8. Agnostic George William Baynham (24), a bank clerk from Dublin City, boarding with a mainly Presbyterian family at 41.2, Blessington Street, Dublin 7. Agnostic Thomas Boyce (37), a Commercial Clerk at a Biscuit Factory from England, living with his Catholic wife Mary from Galway at 9.1 Eccles Street, Dublin 7. Agnostic Hugh B Faulkner (44), a man with ‘Dividends Interest’ from Dublin, living on his own at 13.2 Ulverton Road, Dalkey, Co. Dublin. Agnostic John MaCallan (56), an Analytical Chemist from Dublin, living with his Presbyterian mother and two sisters at 14 Malahide Road, Malahide, Co. Dublin. Agnostic Samuel Montague Martin (40), a Andytrical Chemist from Belfast, living with Presbyterian wife Minnie at 33 Sandymount Avenue, Dublin 4. Agnostic Gustavys McAlpine (28), a Electrical Engineer from Egland, boarding at 50 Burrow, Howth, Co. Dublin in the house of Thomas Lanbtree (29) a Church of Ireland Railway Official from Co. Meath. Agnostic Robert Robertson (22), single electrician, boarding at 39 Burrow, Howth, Co. Dublin the home of Thomas Ellis (37), a Catholic Clerk at a Railway Clearing House originally from Cornwall, England. Agnostic Reginald Alfred Mitchell (31), a ‘L.L.S. Barrister-at-Law In Actual Practice’ from County Monaghan, boarding at 4 Upper Leeson Street, Dublin 4. Agnostics Isabella Richardson (41), married, and her son Harold B (3), both from Dublin, boarding at 11 Bloomfield Avenue, Portobello, Dublin 8 in the house of Church of Ireland landlady Anna E Wolfe (50) also from Dublin. Jews, Protestants and Agnostics boarding in Bloomfield Avenue, Portobello. Agnostic John Strong (22), a single Engineers Apprentice from Dublin, boarding at 1 Martin Villas (? ), the home of Patti Farlow (57), a Church of Ireland widow from County Wexford. Agnostic John Edmond Walshe (54), his agnostic wife Lizzie (52) and their agnostic son Frederick Edmond (21) living at 3, Kimmage (Road? ), Dublin 12. John was a retired printer, Frederick was a Contractor Civil Servant. Agnostic Widower Robert John Smith (44), a Bank Cashier from Dublin, boarding at 46.1 in Harrington Street, Portobello, Dublin 8, the home of Elizabeth Wannan (53), an Epescopelian Hotel Proprietress from County Wexford. Athiest Widower Robert John Smith. Agnostic John H Whyte (30), a carpenter from England, boarding in the home of William C Dunne, a Catholic Assurance Agent at 7 South William Place, Dublin 8. Agnostic George Orr Wilson (70), a Land Owner from County Antrim, who lived with three servants at 73 Temple Road, Blackrock, Co. Dublin. 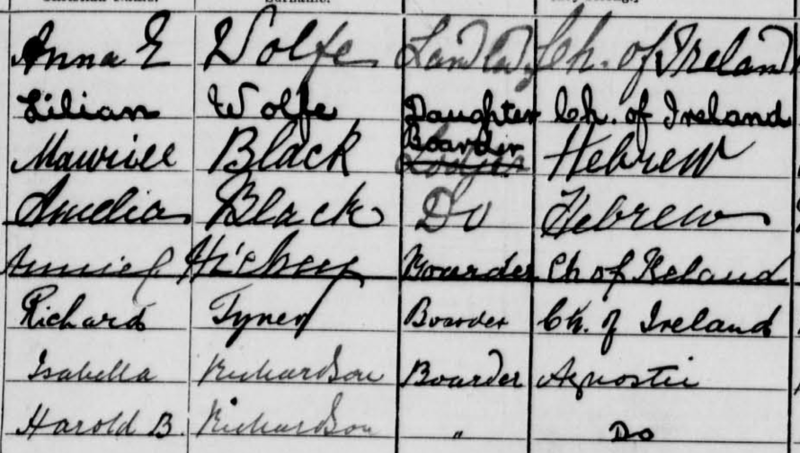 I’m fascinated that in the 1911 census, of only ten columns of questions, one is headed “If deaf & dumb; dumb only; blind; imbecile or idiot; or lunatic”. I’d be interested to know the statistical breakdown of this.